Maker of stringed instruments from the guitar, mandolin and ukulele families. Tenor guitars are a speciality. 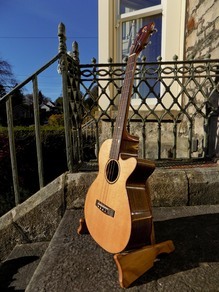 The tenor guitar shown above was recently delivered to a customer in Dublin. 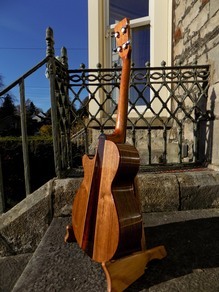 Further photos, an audio track and details of this guitar (TG009) can be found in my Gallery. The gallery also features some of the instruments that I have made to date. Please visit the Artists pages for details of musicians who play my instruments. My instruments are mainly made to commission. To commission one of my instruments, or discuss a repair, please click here to contact me. On some occasions there is an instrument available for immediate sale. Click the Available Now tab for details. You can click on most images on this website to show a larger picture.